In 2012, when Don Munro heard then Natural Resources Minister, Joe Oliver, slamming “environmental and other radical groups” that were getting in the way of forestry, mining and energy projects, he thought, “That’s me!” He and wife Pam worked with a local store to design an iconic t shirt that quickly sold out. Coal Watch picked up the idea (that the Munroes were more than happy to share) and sold three more batches to raise funds for the fight against Raven Coal. Back by popular demand, Comox Valley Council of Canadians is selling these t shirts once again – this time to raise funds for the First Nations who are fighting against the Enbridge pipeline. 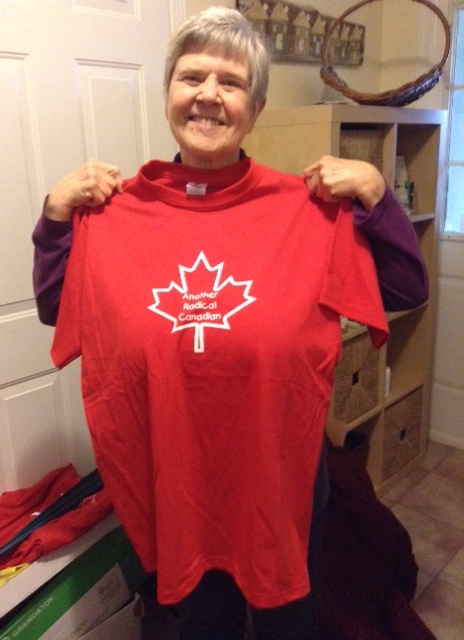 What a great Christmas present – perfect for wearing every Canada Day…and every other day! This entry was posted in Council of Canadians, Democracy, News and Events and tagged Comox Valley Council of Canadians, Joe Oliver by riverside11. Bookmark the permalink.